In a nutshell (and this is taken straight from a most excellent slideshow presentation by Samuel Wood aka Otto), a Post Format in WordPress is a label that can be used by a theme to customize how the theme displays a post. There’s more to say, of course, but let’s jump to the why you should care part. Why you should care about WordPress Post Formats if you blog. Blogger’s Block will disappear. Quite simply, you’ll blog more. The more you blog, the better positioned you’ll be to earn more attention, trust, and engagement. And after all, whether you’re blogging for business or blogging for fun, isn’t that why you’re blogging? No longer paralyzed by the nagging question, Is this idea of mine really blog-worthy, or is it better for Twitter or Facebook or Pinterest or LinkedIn or YouTube or Flickr? you’ll rush to put fingers to keyboard and share your content with your tribe. Because with nine new Post Formats to choose from (see below), everything from a sharable Web link (which previously you might only have tweeted) to the photo of your newborn granddaughter (which previously you might only have posted to Flickr) to your pithy 50-word reaction to what the Cable News talking head just said (which previously you might only have posted to Facebook) — all of these will work in your Post-Formats-friendly blog theme. Why you should care about WordPress Post Formats if you read blogs. You’ll enjoy and get more value from your favorite bloggers’ blogs as they centralize their words of wisdom in one place. You’ll appreciate the one-stop shopping experience. Why you should care about WordPress Post Formats if you provide content marketing consulting services. If you’ve read the above two sections, you know the answer. Why you should care about WordPress Post Formats if you design or customize WordPress themes. You’ll get more business. Much of it will probably come from existing clients. 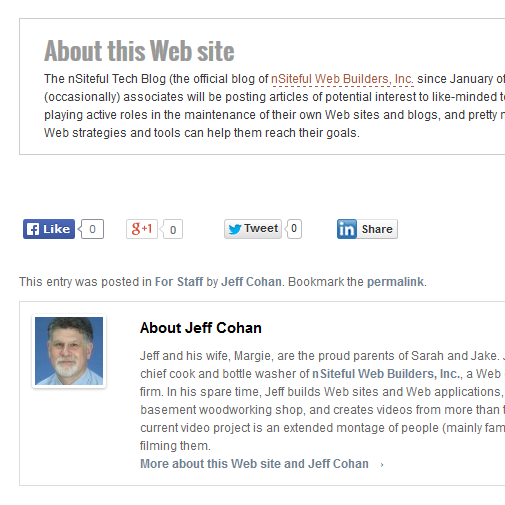 Keep in mind that the Post Formats feature was only added to WordPress in February of 2011 (version 3.1). Twenty Eleven was the first WordPress.org theme with native support for Post Formats. (Someone please correct me if I’m wrong.) To be sure, independent theme developers (the savvy ones, anyway) have been building Post Formats support into their themes. But you can bet there are a whole lot of WordPress blogs out there that need people like you to make them Post-Formats-friendly. Back to "What are Post Formats?" Again, a Post Format in WordPress is a label that can be used by a theme to customize how the theme displays a post. Unlike Post Categories and Post Tags, both of which are ways to classify posts by topic, Post Formats are topic-apathetic and are designed to be used for formatting and display only. While it’s true that one could (and still can) use categories and/or tags (and some theme-hacking) to affect the way posts are displayed, such a practice is arguably a bastardization of how categories and tags should be implemented. With the introduction and adoption of Post Formats, we can now have the best of all possible worlds. I hope this article gives you a bit of a framework for understanding what Post Formats are and why you should care. Stay tuned for more articles about Post Formats, including one that attempts to paint a more vivid picture through the use of a real-world scenario. As always, I hope you’ll join the discussion.